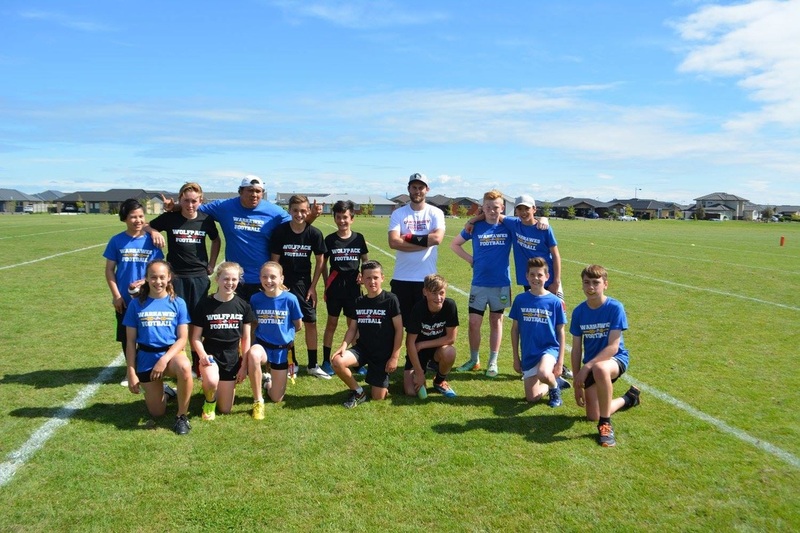 AFC is home to one of the premiere Junior Football programs in New Zealand and home to the only 'Junior Flag Football' competition in the country. Junior Flag Football is offered for ages 10 to 15. Flag Football is a Co-Ed sport - AFC offers a variety of training, skills and school holiday camps along side of a full 10 Week tournament. Previously held on Friday nights at Marshland Domain in Christchurch. 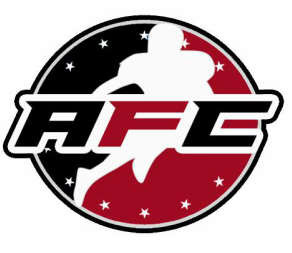 In 2019 AFC will be embarking on it's first ever Youth Contact Football program. Developing children from ages U14 - U17. This will be a transition to Senior Contact football. Each child will have the opportunity to learn and develop their skills, lead by top New Zealand players and Coaches. Children will be established into 1 of 4 clubs. Northern Wolfpack, Southern Rebels, Western Warhawks, Eastern Spitfire. This program is operated by Mase Shaw who is North American qualified in both Junior Flag Football and Youth Contact Football. As recognized by Football Canada and USA Football. After spending 2016-2017 developing our Juniors program, he decided to head to North America in 2018 gaining expertise and Coaching experience in order to better our program and push it forward for the years to come. Much like 'Ultimate Frisbee', 'ENDZONE' is played with similar rules, but involving a Football. This game is developed to promote passing and catching skills within Juniors aged 7-10. Much like the rules of 'Endball' and following a similar style of Netball, the game is fast paced and easily adapted for children to play with equipment. 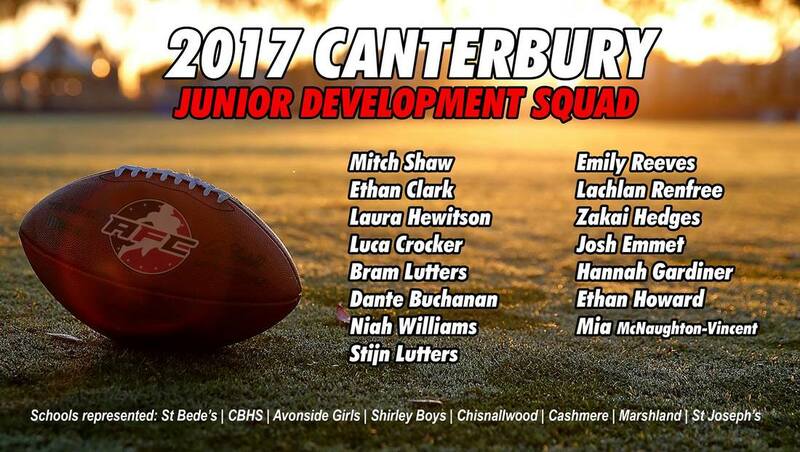 ​After an amazing 2 days at the Canterbury Junior Football Development Camp, we are proud to announce our 2017 Development Squad. It was a grueling 2 Days in the heat, but the skill set and action from these players blew us away - making it a hard decision to name a squad of 15 from a total of 43 players. Awesome day at Day 1 of our Canterbury Junior Football Camp! A lot of skill and some great plays being made. Looking forward to Day 2 tomorrow and the games ahead! The morning kicked off with a bang as the Junior Wolfpack took on the Junior Warhawks in a high flying battle of touchdowns and defensive plays. 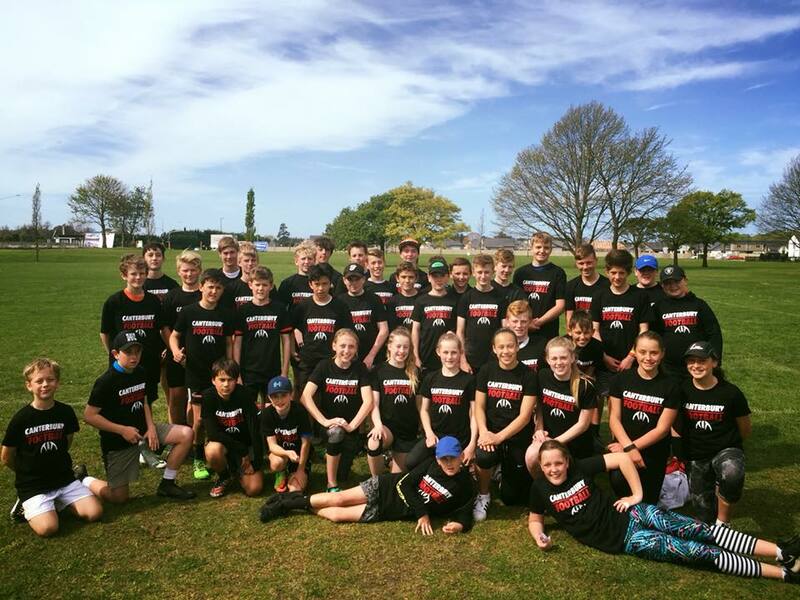 Picked from the Canterbury Junior training camp held in the Term 3 Holidays, the Junior 'Pack and Junior 'Hawks put on quite the show. the Junior pack came out on fire with a quick touchdown to get the games rolling. Connections from Mitch Shaw to Laura Hewitson for the 'Pack proved crucial as the speedster bounced around defenders along side of 'twinkle toes' Dante Buchanan. Boston Canton and Ethan Clarke put up a spark as the 'Hawks bounced back with clutch catches from Luca Crocker and Cooper Freeman all leading to epic aired out Touchdowns. The Junior Pack showed a dominance on the field as they held out the 'Hawks offensively. The Pack won 59 - 21.